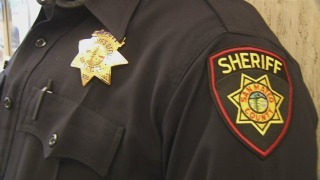 A man in a car repeatedly asked a 12-year-old boy, who was on his way to a friend's house Sunday in San Carlos, whether he wanted a ride, San Mateo County sheriff's officials said. The incident occurred at about 3:30 p.m. as the boy was walking in front of Central Middle School at 757 Cedar St. The man drove up in a newer model silver sedan and asked the boy whether he wanted a ride. The boy said he did not need a ride but the man persisted until the boy told him that he would call the police, according to sheriff's officials. Then the man drove away north on Cedar Street. The boy spoke with his mother who called the sheriff's office to report the incident. Sheriff's officials said the man was white, about 70 years old with gray and white medium length hair. Sheriff's officials said they don't know whether the man was trying to help the boy or whether the man's actions are suspicious.